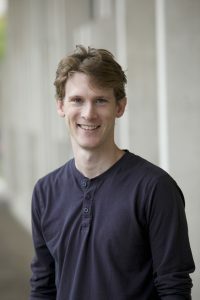 As a CLIR Postdoctoral Fellow, Dr. Henry Alexander Wermer-Colan will develop his own research and contribute to digital scholarship outreach during his two-year appointment. Alex holds an M.A. in the Humanities from the University of Chicago and a Ph.D. in English from the Graduate Center, City University of New York. His research reconsiders a decadent lineage in Euro-American literature as a counter-discourse to an increasingly cynical imperial ideology in the twentieth-century. His current work explores the potential of digital tools for rhetorical and ideological analysis, both of primary sources like avant-garde works of literature and, secondary sources, such as reviews of post-1968 war films. Alex runs workshops for the DSC on computational methods of interpretation, while offering consultations, and developing research projects curating data and teaching primary source literacy using the Center’s growing corpus of science fiction literature and the Charles L. Blockson Afro-American Collection. To contact Alex, email alex.wermer-colan@temple.edu and on Twitter @alexwermercolan.